The UN is meeting in an effort to find consensus on moves to reform the body, as well as tackling poverty. 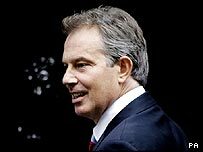 But Mr Blair has also ensured terrorism is on the agenda and said the world must make sure "the future does not belong to fanatics". Mr Blair said at the UN's 60th anniversary summit: "We should not underestimate what we face. "This terrorism that has today again claimed the lives of innocent people, this time queuing for jobs in Iraq, that has now disfigured countries in every continent, at every stage of development, with every conceivable mix of races and religions. "This terrorism is a movement. It has an ideology and it has a strategy. And the strategy is not just to kill. It is by terror to cause chaos and instability and to divide and confuse us, the enemy of this terrorism. "It won't be defeated until we unite, not just in condemning the acts of terrorism, which we all do, but in fighting the poisonous propaganda that the root cause of this terrorism somehow lies with us around this table and not with them." He added: "They want us to believe that somehow it is our fault. That their extremism is somehow our responsibility. "They play on our divisions... they exploit our hesitations. This is our weakness and they know it - and we must unite against this ghastly game with our conscience." The UN Security Council backed the resolution brought forward by the UK, calling on all states to outlaw incitement to terrorism. US President George Bush told the Security Council that governments had a "solemn obligation" to stop terrorism in its early stages. He said: "Today we support a resolution sponsored by the United Kingdom that condemns the incitement of terrorist acts and calls on all states to take appropriate steps to end such incitement. "We have a solemn obligation to stop terrorism in its early stages, we have a solemn obligation to defend our citizens against terrorism, to attack terrorist networks and deprive them of any safe haven, to promote an ideology of freedom and tolerance that will defeat the dark vision of the terrorists. "We must do all we can to disrupt each stage of planning and support for terrorist acts. Each of us must... deny terrorists freedom of movement by using effective border controls and secure travel documents, to prevent terrorists from acquiring weapons, including weapons of mass destruction." The three-day World Summit has been dominated by discussion of what to do about global poverty and how to reform the UN after 60 years in operation. The draft hammered out after weeks of bitter wrangling pledges to honour anti-poverty goals, but other points are diluted or omitted entirely. UN Secretary-General Kofi Annan told reporters the draft document had two important omissions - non-proliferation of nuclear weapons and disarmament. Where are the green goals? Is the UN a spent force? Should we help the world's poor?